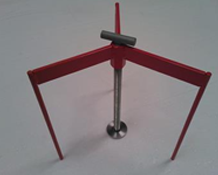 We offer a wide range of equipment and tools to help you complete your screeding jobs. 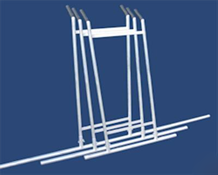 Our screeding dapple bar set comprises of a handle assembly and 900mm, 1500mm and 2500mm bars. The removable handle attaches to each size bar allowing you to change bars depending upon the size of the work area. Manufactured in aluminium the dapple bar set is lightweight and easy to use making it effective and easy to operate over the screeding surface. The dappling bars effectively both remove trapped air from the screed material and with a second pass help to smooth and finish the surface. Used to set out with a level prior to laying floor screed. The “platforms” are all set to the floor level using a laser level, adjustment is made by screwing up and down. Prior to final finishing with a dappler the tripods are lifted out of the floor screed. 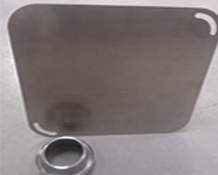 This high quality screeders flow plate and ring is used for testing the flow rate of a screed.